Today I'm sharing a card I created with the Antiqued Glimmers Technique found in the December TJNL. If you're a TJ Subscriber, the December issue should be hitting your mailboxes sometime later this week. If you're an ultimate subscriber, the online issue will be going live this week! Not a subscriber, you can read more here. 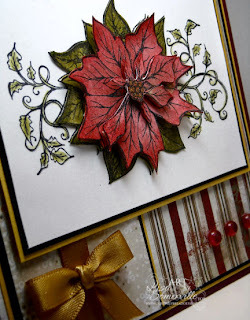 I started out by stamping the Poinsettia from Our Daily Bread Designs Blessed Christmas in Black Archival on Heavenly White Ultrasmooth. 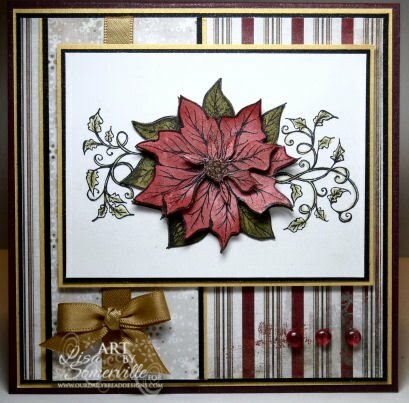 I used additional pieces of White card stock, applying my Antiqued Glimmers to both pieces. My color choices for this technique, Peeled Paint Distress Ink, Fired Brick Distressed Ink and Iridescent Gold Glimmer Mist. Once my pieces dried, I stamped the image on the Green and Red pieces and cut them out, adhere the Green to the stamped image, then the Red using dimensionals. To add a bit more dimension, I cut out the smaller petals and popped them up. To add color to the vine, I use an H20 Brush and Peeled Paint ink. Really beautiful! The poinsettia looks so real! This is beautiful Lisa! I just love this technique! This is stunning, Lisa! It makes me want to reach out and touch the poinsettia. Amazing, it's so real looking....really luvin' this piece of art! What an absolutely GORGEOUS card!!! I love it! Another gorgeous creation! Love this! Gorgeous! Can't wait to learn how to do this technique! Just stunning Lisa. I love all the little extras. Fabulous job, thanks so much for playing along. Hope you have a great Thanksgiving! This card is stunning!!! Awesome job on the colors. the 3D effect you got with this is outstanding! LOVE IT! This is stunning, Happy Thanksgiving!